10 ways to monitor mobile users with the help of mobile tools and analytics to get mobile traffic. A detail report on how mobile devices will release personal computers in the future. Study based on mobile analytics and monitoring tools. Future projections of mobile browsing and desktop browsing with monitoring tools. In 2013 every one out of 10 persons is a mobile user. And day by day the numbers of mobile users are increasing with rapid growth. So below are the future projections and data that will show you how internet browsing through mobile is replacing desktop browsing. Seeing these changes it is mandatory for every webmaster to optimize website for mobile devices so they can leverage mobile traffic and not lose the important mobile traffic. Do you know 51% of United kingdom mobile owners are now using their devices for commerce. It means they have started to buy and purchase item through mobile phone which was first dominated by desktop users only. So it is a first sign but very strong one, 51% means 23 million people, which are very large in number. As commerce statistics show that 51% users are using devices for shopping but do you know how many websites are optimized perfectly for mobile. The study shows that only 10% website is optimized for mobile devices. It means that 90% websites are not meeting customer demands. Use mobile traffic analysis to give you an indication of whether you need to make your current site responsive or whether the amount of traffic you receives justifies a separate mobile site. 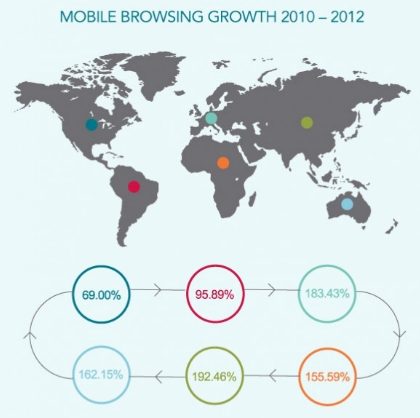 From the image you can clearly understand the use of mobile devices for browsing internet is gradually increasing . 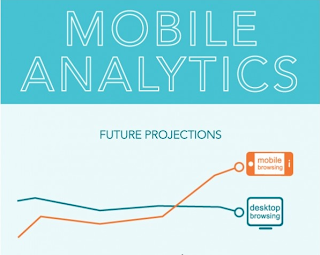 Do you know what the PCs vs Mobile analytics averages. A desktop user visits 6.40 pages in a single visit whereas a mobile user 4.75%. Time spent on site by a desktop user is 323.67 whereas 218.83 seconds by a mobile user. Bounce rate for desktop user is 39.81% whereas for mobile user 42.40%. The conversion rate for desktop user is 1.72% and for mobile user is .61%. From above facts you can see desktop users still dominating mobile users but when it comes about buying and selling mobile users are dominating desktop users. Average Order size in percentage for desktop user is 60.03. Average order size for mobile users is 61.13. So in terms of online shopping mobile users are more active than desktop users this is why m-commerce is emerging as a new field. You can use google mobile app analytics beta to monitor your mobile user on below points. Find out how often your app is downloaded installed and how successful certain marketing campaigns are attracting visitors. Get to know the people using your app - where they are, how often and long they use an app, and what devices are popular with your visitors. Track in detail the ways users interact with your app, find out which screens are viewed in a typical visit or set up event tracking to analyze custom actions, like button clicks and video plays. Technical exceptions and crashes are also included in this set of reports. Know the real value of your app. Set up goals and eCommerce to track targeted objectives, like completed sign ups and completed sales. These are the bases on which you can monitor your mobile users and then create an app that actually converts and makes more sales. From the above facts and analytics reports, it is very clear that it is time to optimize a website for mobile devices otherwise we will lose a large amount of traffic. So in order to get benefit from those mobile users and to make more sales optimize your website for mobile devices and use responsive layouts. Every person in the world at least can afford a smart phone but not the desktop so it's better to optimize website for mobile than the desktop users because analytics says that.so these were the 10 ways to monitor your mobile users with mobile analytics and tools. Description : 10 ways to monitor mobile users with the help of mobile tools and analytics to get mobile traffic.